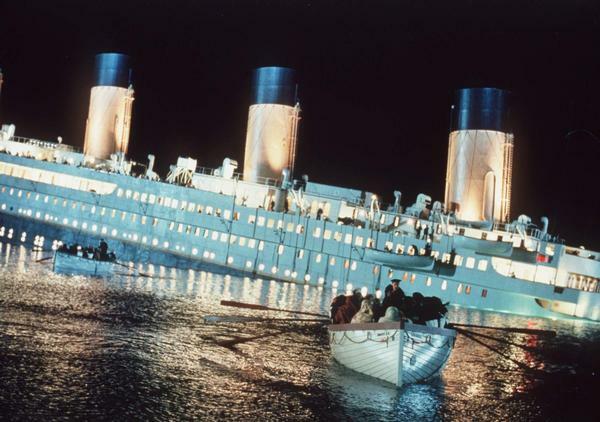 To commemorate the one hundred year anniversary of the sinking of the RMS Titanic in 1912, director James Cameron is rereleasing his blockbuster film in 3D. The film begins in modern times when a group of treasure hunters, including Brock Lovett (Bill Paxton), are using technology to try and extract objects from the wreckage of the Titanic. Luck stumbles upon them when they are contacted by an elderly woman named Rose (Gloria Stuart) who says she is the woman in one of the drawings they found. When they ask her about the whereabouts of a diamond called the 'Heart of the Ocean', she recalls her time on the ship to them. 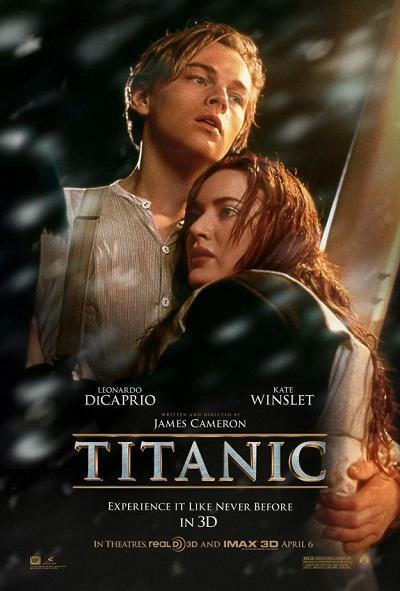 Boarding the Titanic as a young woman, Rose (Kate Winslet) feels smothered by her family, including her dogmatic fiancé Cal (Billy Zane) and her mother Ruth (Frances Fisher). Staying on the lower decks is Jack (Leonardo DiCaprio), an artist who won his ticket in a poker game. 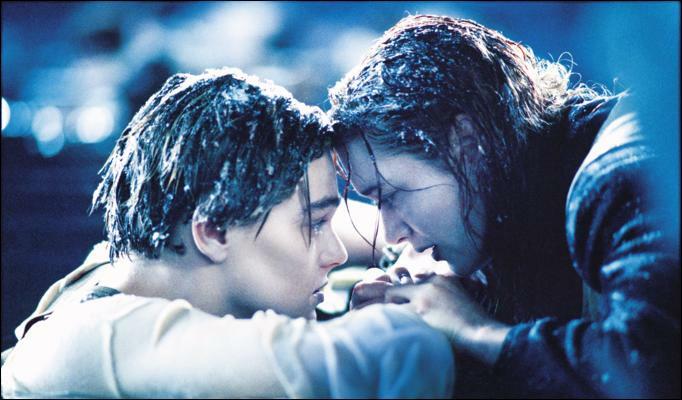 One night Jack saves Rose from throwing herself off the back of the ship and they start to fall in love with each other. Their affair is disrupted by Cal and his bodyguard and the collapse of the ship after it strikes the iceberg. How did he do it? When James Cameron's film was first released in 1997 it was regarded as one of the most lavish and expensive films of all time. Yet despite winning a record number of awards its reputation as a great American film has been tarnished. Titanic's most iconic moments have been imitated and mindlessly parodied so frequently that it is easy to forget that the film is not only a great love story but also one deeply critical of capitalism, self-interest and ambition. Watching the film today and it has not aged in the slightest. There are sequences so extraordinary that they continue to defy our comprehension for what is possible in modern cinema. Yet this is in no part thanks to the superfluous 3D conversion. Unlike Cameron's Avatar (2009), this film was not shot for 3D, which means that there are very few scenes that standout as being significantly enhanced. The limited use of 3D means that it is easy to be cynical about Cameron rereleasing the film as a cash grab, rather than a tribute to the century marking the ship's collapse. However, Titanic warrants another viewing, not only because it is spectacular on the big screen but also because the film's powerful moral core has been sustained, elevating it above the conventions of its love story and into a timeless critique of human indecency. The film documents how there were so few lifeboats available on the Titanic that only half the ship's passengers could be saved because there was little thought of aiding the lower-class decks. Watching the film again after the GFC, where the wealthy showed equally little compassion and it is apparent that nothing between 1912 and 2012 has changed. The way the film damns the wealthy upper-class, harking back to the Capra-era of filmmaking, means that Cameron could quite rightly be accused of being hypocritical. He is a director deeply embedded in the Hollywood system and has made two of the highest grossing films of all time, one of which is Titanic itself. Yet when people rewatch this film they will be reminded of just how much anger and guilt Cameron shares between himself and the screen. Consider for example the way that Cameron has chosen to frame the narrative to project his own self-refection. Brock and his team are treasure hunters, who initially seem only interested in the valuables and the technology, exploiting the ruins of the vessel. When he demonstrates the dismantling of the ship on the computer one of the men says to Rose: "Pretty cool huh?" Yet by the end of the film Brock and his crew are unexpectedly moved by Rose's story because they have a greater sense firsthand of what a terrible experience this was for her. Assumedly, this is a mirror of Cameron's own experiences in researching and creating this film, appreciating it as far more than just a commodity. Overcoming blind idealism is therefore one of the film's central themes and is visualised spectacularly through Cameron's sophisticated formalism. Before stepping onto the ship, the low angle shots looking up at the Titanic heighten its grandeur. This is to show how people foolishly believed that it was indestructible because of its size and its power. The fluency of the camera as it sweeps across the decks is also significant because it leads one into a false sense of liberty, believing that there is great freedom and spatiality to be found onboard. This is contrasted with the interior rooms, where cabins, dining rooms and corridors are tightly framed and shot. The delicacy and elegance of the camera movement on the upper decks is used to show how controlled and suppressed Rose's life is as a woman. Her mother even mentions that she doesn't need to go to university because she is already engaged. There is also a clever moment where slow motion is briefly employed to further show the contained, mechanical nature of her upper-class lifestyle. Smartly, Cameron's best films have subverted the female role, where women exude more masculine qualities over the course of the narrative. It's visible in Aliens (1986), the Terminator films and here too. As Rose defies her family's orders the formal elements change, like in a scene where she is dancing on the lower decks with Jack. The rapid panning of the camera asserts her freedom and her independence, which she will later use for her own survival. As pure entertainment, the first two hours of the film are close to perfection. My favourite moments are shared between the scenes at dinner, the exterior shots and those extraordinary early moments where Cameron films the actual wreckage of the Titanic. Fulfilling many of these classic scenes are touches of wit and humour and two charismatic, star-making performances from DiCaprio and Winslet, both of whom have gone on to have distinguished careers. It is surprising that Billy Zane never had bigger opportunities because he makes his character so deliciously wicked. Cal is a man who lives solely through money. Everything can be bought for him, except love. The other side characters are well cast with actors who give their small roles noticeable weight too. The most poignant is the ship's architect Thomas Andrews (Victor Garber). There's a chilling scene where he is reduced to a zombie, watching a clock as his dream collapses around him, weighed down by helplessness and guilt for designing the ship. Frances Fisher as Rose's mother is also fascinating because although her character postures as being wealthy, and excludes others for not being in the same league, she is aware of own family's struggling financial situation and is determined to force her daughter to marry into wealth to save herself. Although Cameron retains a masterful grip on the action, the film falters marginally as the ship begins to collapse. The scenes of Rose running down long white corridors are so isolating they could be straight from a horror movie. But these sequences could have been leaner and there are contrivances that see the narrative veer unnecessarily close to melodrama. Did Rose really need to jump back onboard the ship? The film recovers strongly because the final moments alone in the cold black water are deeply moving. With nothing to save these people, the sense of loss and despair is palpable and haunting. The film favours moral complexity over simplistic emotions of physical suffering too. Cameron unflinchingly shows us the cowardice, the arrogance and self-interest of people who opt only to save themselves, while the others are left to freeze to death in the icy water. Thus, although the 3D is underused and underwhelming, this might be the last chance to see this terrific film on the big screen again. Other than being visually stunning, it is compulsive viewing because of its intelligence and willingness to explore class, ambition and gender politics. However Cameron did it, this is a great American blockbuster.